Photograph courtesy Roger Geach A short lightly loaded Luton - Willesden feeder service passes Chiltern Green with 25193 on September 30th 1980. The nineteen year six month career of D7543/25193 was spent allocated to London Midland Region depots, including much going backwards and forwards between Cricklewood & Toton in the mid to late 1970s. Dual brake equipped (Feb 1978). February 1971 to Birmingham Divison (D02). May 1971 to Preston Division (D10). 25193 was the 224th Class 25 to be withdrawn, one of six retired during November 1984. After withdrawal 25193 was noted at Allerton depot on November 25th 1984, before moving to Toton, remaining here until February 21st 1985 when it moved to Gloucester (see full details below), then on to Swindon Works by February 25th 1985. 25193 was part of a batch of condemned locomotives to leave Swindon Works on June 3rd 1987, moving to Cocklebury Yard, then to Leicester, Humberstone Road and entering Vic Berry's yard on July 4th 1987. The locomotive was briefly placed in the stack, being removed in early November 1987 and scrapped by the middle of the month. 25161, 25193 & 25207 Toton – Gloucester – Swindon February 21st-25th 1985. 25093, 25126/134/161/164/180/193, 25207/208/260, 25306/327 Swindon Works – Cocklebury Yard, June 3rd 1987. Noted Crewe Works February & March 1970 (accident damage). Noted Derby Works February 1978 (classified repair & dual brakes fitted). Noted Derby Works August 1984. On August 6th the 08.36 Nottingham - Llandudno Town and the return working to Nottingham were worked by 7543 & 7560. 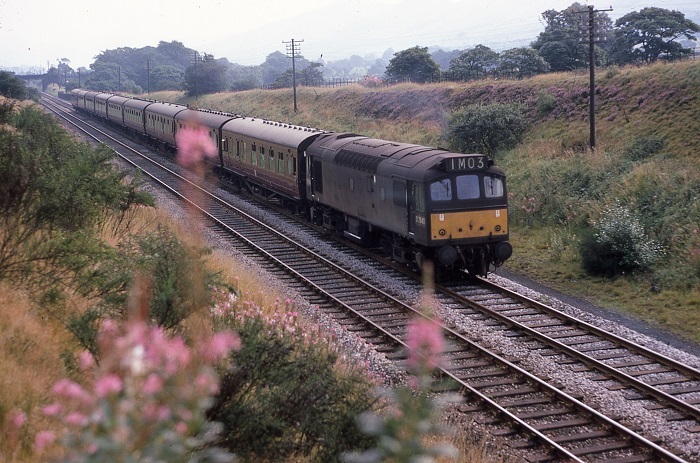 Photograph collection of webmaster D7543 and nine coaches, believed to be the summer of 1967 near Edale, the exact mileage is 170m 440 yards (from St Pancras) and the train is about to enter Cowburn tunnel. In the background is the outline of Mam Tor. The flowers in the foreground are foxgloves, the condition of the grass on the embankment suggests its high summer, maybe late July. Condition May: two-tone green livery with full yellow cabfronts, hand/footholds present, engine exhaust in original position, straight sided sandboxes, three-rung bogie mounted footsteps, 'D' prefix present. On October 28th the 17.00 Manchester Victoria - Newcastle was worked by 7543. The continuing shortage of power on the WR allowed many strangers to reach deep into WR territory, the 18.00 Riverside – East Usk frequently featuring pairs of Class 25’s, November 14th produced 25193 & 25073. In the early hours of June 6th whilst waiting on the slow lines with a coal train at Nuneaton station 25286 witnessed the high speed derailment of the 5th’s 23.30 Euston – Glasgow sleeper service. The two locomotives, 86006 & 86242 became parted, with the latter causing considerable damage to itself and the station, bringing down several gantries that caused minor damage to the Class 25. All the coaches were derailed, with damage being heaviest at the front of the train, tragically six lives were lost. By the evening of 6th the Bescot, Crewe & Saltley cranes were present alongside other engineering trains, in the hands of 24074, 25179, 25193, 25256 & 47034. Six coaches, (five sleepers and a BG) were broken up on site. By the 11th engineering/rewiring trains were still present including 24074 and 25193, the latter having been on-site since the day of the accident. Two days later only 24058 was on hand with an engineers train. A Shrewsbury – Gourock excursion on July 10th suffered a failure shortly after departure with 25193 & 24081 requiring assistance from 37040, the cavalcade being replaced at Warrington by 81004. 25193 was noted at Cardiff Canton on June 7th having arrived in the Cardiff area on a freight from Crewe. Possibly 25193's longest passenger turn took place on June 11th with 25521 working a roundtrip Matlock - Barmouth day excursion (375 miles). Alomst two months later on August 5th 25193 & 25178 worked a roundtrip Derby - Skegness. No passenger workings have so far been reported for 1979. Strangers at Norwood Junction on March 29th were 25193 & 25099 having worked from Willesden with a Manchester United football special for a match at Crystal Palace. On June 28th 25193 & 25222 worked the first two miles of the 08.55 Kensington Olympia - Perth motorail as far as Willesden. 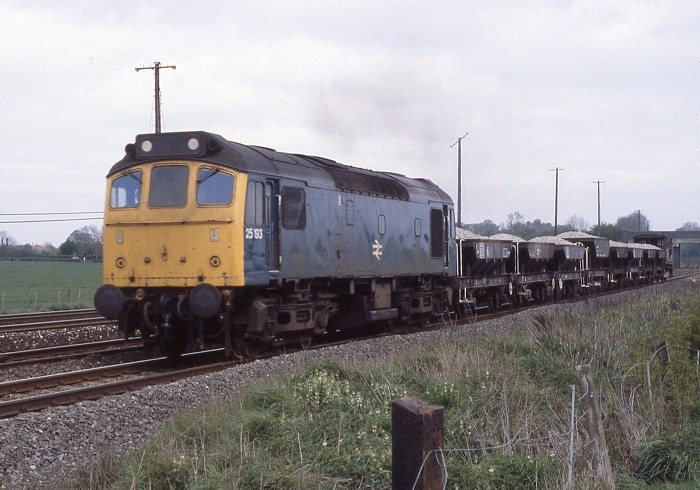 25193 heads south near Syston Junction, May 6th 1980. 25173 & 25193 were noted at Kensington Olympia with a motorail service on August 4th. The 02.25 Euston - Bletchley was worked by 25193 on September 13th & 20th. Also on the 20th the 21.18 Perth - Kensington Olympia motorail was worked forward from Willesden by 25193. The 03.47 Willesden – Bescot freight running behind 25193 & 25058 became partially derailed at Bletchley on October 23rd. A burned off journal caused most of the train to derail, only the locomotives and several one hundred ton oil tankers remained on the rails. Electric multiple units 087 & 092 standing in the station sustained minor damage, luckily the fast lines remained open, though it would take three days to clear and repair the slow lines. The Foss Islands branch, home to the Rowntree factory saw the local trip working receive Type 1 & 2 haulage during May, including 25193 (14th) in lieu of the regular York Class 08. On June 8th 25193 worked the afternoon Manchester - Bristol parcels. Another lengthy trip took place on June 27th with 25193 & 25145 working a 'Cambrian Venturer' charter from Birmingham International to Aberystwyth and return. 25193 was stabled at Toton on July 3rd and received an 'E' examination at Toton during July. On August 2nd 25193 was recorded as working a portion or all of the 17.14 Derby - St Pancras. The 19.26 Barrow - Preston was worked by 25193 on August 18th. A Skegness - Llandudno Town return mystery excursion on August 30th required the use of 25193 & 25195 as far as Derby following the failure of the booked 47236. A diesel multiple unit failure on September 8th saw 25193 work the 09.55 Llandudno Town - Blaenau Ffestiniog and 11.18 return. On August 11th 25193 was noted westbound passing Ulverston with a short freight of four nuclear flask vehicles and a brake van. Despite being allocated to Cricklewood for all of 1983, 25193 worked quite a variety of passenger workings. On February 1st the 06.50 Paddington - Glasgow Central utilised 25193 & 25231 between Preston & Carlisle, via the Settle & Carlisle. On February 24th 25193 worked the 15.13 Manchester Victoria - Barrow throughout. On March 26th 25193 was stabled at Skipton station with a single oil tank. April 17th saw the 08.40 Liverpool - York worked forward by 25193 from Manchester Victoria, via Healey Mills to York. 25193 was the Manchester Victoria pilot on April 19th, 20th & 23rd. 25193 was stabled at Cockshute on April 30th. A visit to East Anglia on June 22nd saw 25193 handling the 08.04 Birmingham New Street - Norwich. 25193 was noted at Crewe station on June 26th. On July 4th the evening 4E78 Forders - Kings Cross fletliner was worked by 25193 & 25117. The failure of 81001 on July 6th at Bletchley on the 13.18 Birmingham New Street - Euston saw 25193 take the service in to Euston. It was off to the Cambrian line on July 16th with 25193 & 25236 working the 07.35 Euston - Aberystwyth forward from Shrewsbury, returning with the 14.00 Aberystwyth - Shrewsbury. On August 14th three southbound services with 25200 were handled between Rugby & Bletchley due to the power being off. The next day (15th) 25193 worked the 06.25 Poole - Liverpool between Coventry & Birmingham New Street. 25193 was stabled alongside Peterborough station on August 27th, four days later (31st) 25193 was still in the Peterborough area handling a daily trip freight including delivering paper to a nearby St Neot's factory and household coal to the coal merchant in the station goods yard. 25193 was noted at Banbury on September 9th. Four days later on September 13th 25193 was noted at Lawley Street freight terminal. 25193 was noted eastbound at Barton Moss on October 22nd with a parcels train on ten bogie vehicles. The final working for 1983 took place on December 21st with 25109, assisting a Class 86/2 on the 23.00 Glasgow Central - Euston between Bletchley & Euston due to the power being off. 25193's last transfer was to Crewe during January. An afternoon additional Ellesmere Port - Westbury bitumen tank train on March 3rd was noted at Hereford behind 25032 & 25193. On August 24th 25193 worked the relief 03.55 Crewe - Stoke-on-Trent. The final passenger workings took place on September 1st with 25193 & 25282 working the 07.44 Shrewsbury - Aberystwyth and the 10.10 Aberystwyth - Euston to Wolverhampton. 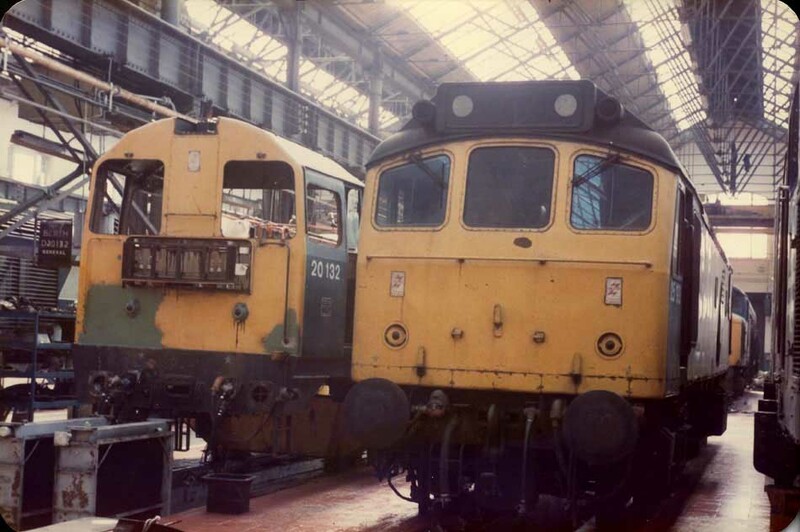 Photograph courtesy Jerry Glover A busy scene in Derby Works on August 11th 1984. 20132 is in for a General repair including the fitting of dual brake equipment and slow speed control. 25193 is received for minor repairs and will not stay long in the Works. By November 25193 will be retired. 25193 was noted at Crewe station with loaded ballast wagons on August 27th. 25191 & 25193 were noted passing through Crewe station light engines on October 17th. 25193 was the Manchester Victoria pilot on October 26th. 25193 was withdrawn on November 12th 1984. No.1 cab front: large rust patch below center window: September 1980 until withdrawn.